AV for You setup audio and video rental equipment for the Minnesota Utility Investors at Earle Brown Heritage Center. For audio rental equipment we used our Behringer X32 Producer Digital Mixer, our Audio-Technica Podium Microphones and a Shure SM58 Wireless Microphone. For video rental equipment we set up four of our Eiki 7KHD Projectors on 8' Truss Towers in the back of the room. We front projected onto the house screens in the room. 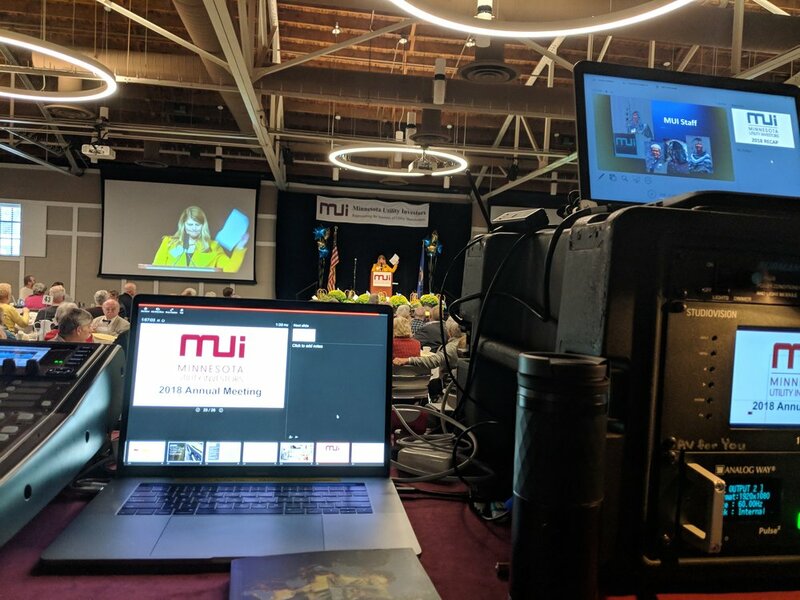 We used our Decimator HDMI-SDI Cross Converters to distribute HD Video to all of our projectors and a 40" Monitor for use as a confidence monitor by the presenters. We also used our Panasonic HD Camera for recording and IMAG at the event.